George Papadopoulos (third from left) and Panos Kammenos (fourth from left) at the St. Regis Hotel in Washington, DC, on the eve of Donald Trump's inauguration. When Trump campaign aide George Papadopoulos pleaded guilty to lying to the FBI, attention fell on his meetings with a mysterious Maltese professor named Joseph Mifsud, who, according to court documents, told Papadopoulos that the Russians had thousands of Hillary Clinton emails — nearly two months before the Democrats themselves knew that their computers had been hacked. But European security officials say another set of meetings Papadopoulos held in Europe in the months before and after the 2016 election should alarm US investigators. That’s because the person with whom he met, Greek Defense Minister Panos Kammenos, is known to be close to Russian President Vladimir Putin — a relationship that goes beyond Greece’s traditional ties to Russia through the Eastern Orthodox Church and a growing relationship brought on by Greece’s economic collapse. “Like much of the Greek economic and security establishment, the Ministry of Defense is considered compromised by Russian intelligence,” said one NATO military intelligence officer, who like the others in this story declined to be identified by name because of the sensitivity of his work. “Specifically, we have been officially warned against briefing Greek ministry representatives about sensitive intelligence operations involving the Russians” because of concerns about his apparent links to their intelligence services. What Papadopoulos and the Greek defense minister discussed during their meetings is unknown. The Greek Defense Ministry did not respond to requests for comment, and Papadopoulos declined to comment, referring questions to his attorneys, who said they could not discuss Papadopoulos’s interactions with Kammenos or his cooperation with special counsel Robert Mueller. But the concerns of the European security officers are a reminder that the US government’s interest in contacts between Trump campaign aides and Russia began as a counterintelligence probe, with Obama-era CIA director John Brennan stressing that such contacts might have been unwitting. The Russians “try to get individuals, including US persons, to act on their behalf, either wittingly or unwittingly,” Brennan told Congress last May in testimony explaining how the counterintelligence investigation began. Kammenos meeting with Priebus and Bannon (left), and posing for a portrait with Priebus (right) at the Hay Adams Hotel in Washington, DC, on Jan. 21, 2017. Papadopoulos also was not the only Trump-connected figure who met Kammenos. 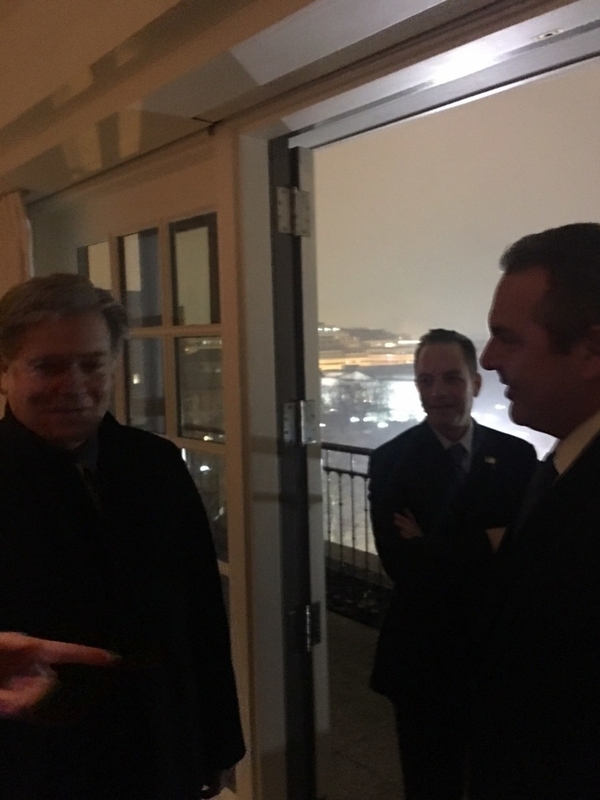 Over the weekend of Trump’s inauguration, Kammenos was photographed at social events talking with incoming chief of staff Reince Priebus and Trump political adviser Steve Bannon. That was in contrast to Kammenos’s visit to Washington in 2015, when President Barack Obama’s secretary of defense, Ash Carter, canceled an already scheduled meeting with him. Photographs showing Priebus and Bannon with Kammenos were distributed by the Greek Defense Ministry. How substantive those encounters — widely reported in Greece at the time — were is unclear. 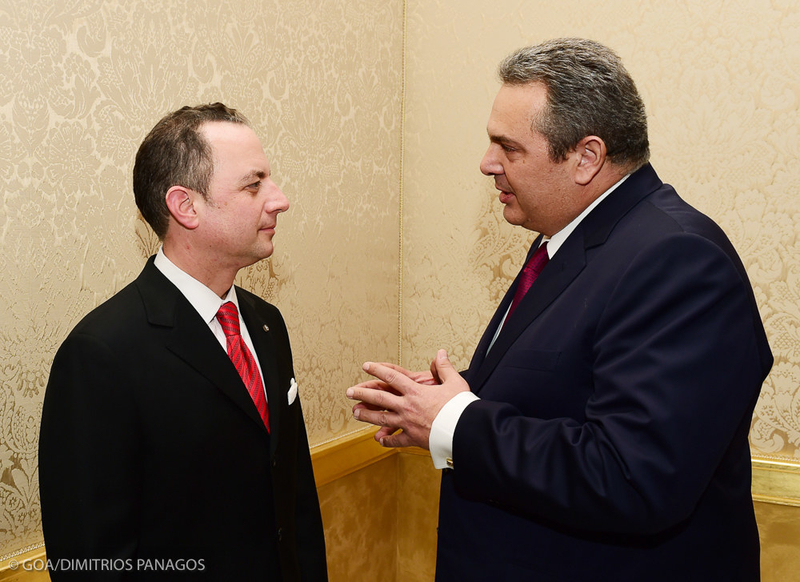 The Greek Defense Ministry portrayed them as private meetings where Kammenos discussed Greek foreign policy goals, and photos of Kammenos and Priebus, shot on Jan. 19 and Jan. 21, 2017, appear to show the two in intense conversation. Priebus declined to comment. 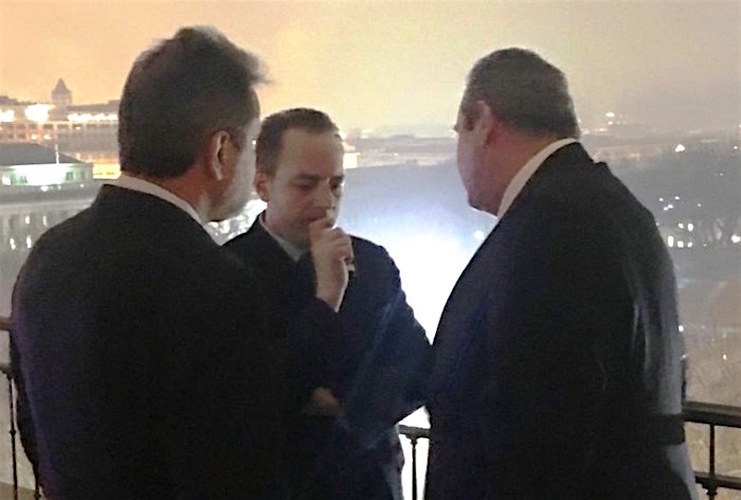 Kammenos and Priebus at the St. Regis Hotel on Jan. 19, 2017, (left), and at the Hay Adams Hotel on Jan. 21, 2017. But Bannon possibly knew who Kammenos was when he encountered him on Jan. 21. A month earlier, Papadopoulos had sent emails to Bannon and Michael Flynn, Trump’s designated national security adviser, describing his contacts with Kammenos, according to a report in the Washington Post. Those emails were sent in the same month Kammenos and Papadopoulos dined together at a restaurant in Piraeus, a port city outside Athens. Greek political observers say it’s no surprise that Papadopoulos, a Greek-American whose parents are from Thessaloniki, Greece’s second-largest city, would be greeted warmly once word was out in March 2016 that he was a foreign policy adviser to a US presidential candidate. 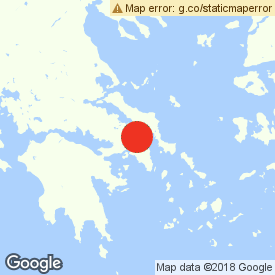 By the time he met with a Greek journalist on May 27, 2016, the 10th day of a visit to Greece that Papadopoulos documented on social media, Papadopoulos had already met with Kammenos, Greek President Prokopis Pavlopoulos, and Greek Foreign Minister Nikos Kotzias, the journalist, Marianna Kakaounaki of Kathimerini, a newspaper in Athens, told BuzzFeed News. By May 31, Papadopoulos was posting photos of the meetings to social media. The Greek Defense Ministry site touted Kammenos's meetings with Priebus and Papadopoulos at Trump's inauguration. “The president of Greece is a mostly ceremonial position, and it’s not much for a prominent Greek-American to get a meeting,” according to one Greek government official who asked not to be identified discussing internal political issues. But Papadopoulos’s meeting with Kammenos was more of an oddity, the official said. “To a Greek, Papadopoulos meeting with Kammenos is a bit of an eyeroll because he’s seen as a bit of a clownish figure with close ties to the Russians,” the official said of the defense minister. To EU security officials, it was alarming. At a minimum, they said, it showed the Trump campaign was naive in allowing a representative to meet with him. “Trump has called him a ‘coffee boy’ or something like it but that doesn’t matter,” said a Central European counterintelligence official, speaking of Papadopoulos. And Papadopoulos’s contacts with Kammenos didn’t end with Trump’s election. Papadopoulos met again with Kammenos in December, an encounter that was documented in a photo posted on social media. The two were also together on Jan. 19, 2017 — the day before Trump’s inauguration — at a reception at Washington’s St. Regis Hotel after a ceremony where the highest-ranking Greek Orthodox Church cleric, Archbishop Demetrios of America, presented the church’s Medal of St. Paul to incoming chief of staff Priebus, longtime Trump aide and incoming White House scheduling and advance director George Gigicos, and Florida Rep. Gus Bilirakis, all prominent Greek-Americans. A video posted by a Greek journalist at the event, which was hosted by the Hellenic Initiative, a Greek nonprofit, shows Kammenos, the highest-ranking Greek official in Washington for the inauguration, congratulating and embracing Priebus. He also presented Priebus with a gift plaque. 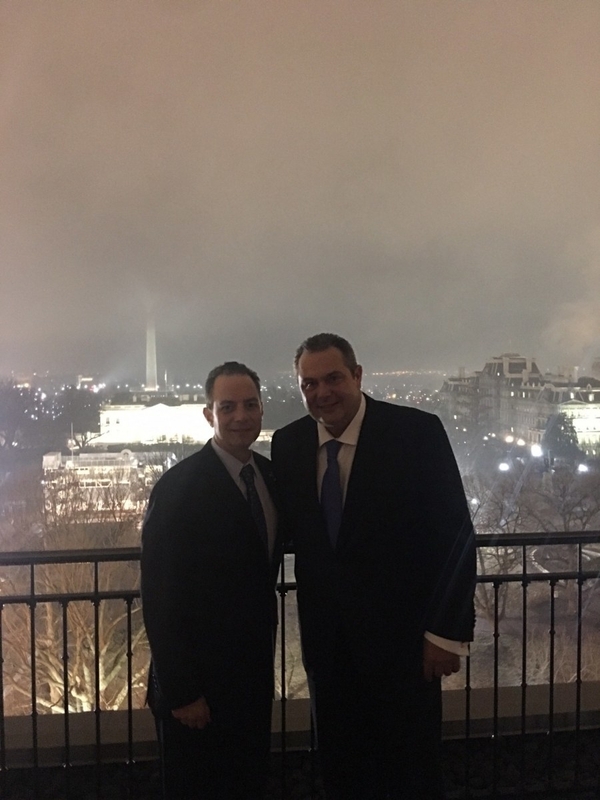 Two days later, Priebus and Kammenos were photographed together on the roof of the Hay–Adams Hotel near the White House. The photo was posted on the Greek Defense Ministry website and widely shared in Greek media reports, which cited a private meeting in which Kammenos briefed Priebus on Greek policy issues. The event where the two met was a reception held to celebrate Priebus’s wife’s baptism in the Greek Orthodox Church, according to Stavros Papagermanos, a press officer for the Greek Orthodox Archdiocese of America. Bannon, Trump’s chief strategist, was also photographed at the reception with Kammenos. Kammenos and Russian President Vladimir Putin during an arrival ceremony at the Athens Airport. Kammenos has never been shy about his affection for Russian President Vladimir Putin, often bragging to associates and even the public of his close connections to Putin. When Putin visited Athens in May 2016, at the same time Papadopoulos was there, Kammenos greeted him at the airport in Russian. “He would have been a very friendly face to the Russians,” said a Greek opposition member of parliament, who like all Greek officials interviewed for this story requested anonymity when talking about domestic politics. Since he became defense minister in 2015, Kammenos has promoted closer military ties with Russia. He announced a program in June 2016 to begin production in Greece of Kalashnikov-style weapons under license from Russia. He has also repeatedly criticized European Union and US sanctions against Russia for its annexation of Crimea and intervention in Eastern Ukraine. “Greece is a member of NATO and the EU, and my message to these organizations is that we need to work together with Russia and do everything possible to lift the embargo, which has been a disaster both for Russia and the EU. Greece is prepared to act as a go-between to make this happen,” Kammenos said of the sanctions to Sputnik News, a state-owned Russian news agency, on April 17, 2015. But what worries European counterintelligence officers more than Kammenos’s public positions are the close ties between Kammenos’s think tank, the Institute of Geopolitical Studies, and the Russian Institute for Strategic Studies, a Moscow think tank managed by Russia’s foreign intelligence services. The two think tanks have an open partnership that was outlined in an agreement signed in late 2014. The Moscow Times newspaper described the RISS — which was operated by the Russian Foreign Intelligence Service until 2009, when it was brought under the control of the president’s office — as a landing spot for retiring Putin loyalists from the intelligence services in April 2017. “It’s hard to find a straighter line between Kammenos and Russian intelligence than this arrangement,” said a NATO military intelligence official. A former British intelligence officer, who asked not to be identified because he still works under contract for his government, said RISS does little to hide its close ties to the Russian intelligence, political, or defense establishments and is widely considered to be a proxy for them. Western intelligence services consider Kammenos’s arrangement with RISS compromising, he said. By the time Papadopoulos arrived in Athens on May 17, 2016, he had already heard that Russia had “dirt” on Hillary Clinton in the form of thousands of emails, according to court documents filed in Washington in connection with his guilty plea to charges that he lied to the FBI. In those documents, Papadopoulos said Mifsud told him that in April 2016 and that Mifsud said he'd learned it while he was in Moscow. Papadopoulos would later pass that information to an Australian diplomat in London, who in turn passed it to his government, which alerted the US government in July after WikiLeaks began publishing hacked Democratic Party emails. The FBI launched a counterintelligence investigation on July 31, 2016. Papadopoulos has been cooperating in the Mueller probe since his arrest July 27, 2017. But the meetings with Mifsud, who has since dropped from sight, and the subsequent attention Papadopoulos received from Kammenos are indications, according to three active-duty intelligence or police officials from NATO countries, that Papadopoulos was likely being assessed as a possible asset for Russian intelligence. The Central European counterintelligence agent said Papadopoulos's interactions with Mifsud raise that possibility, noting that Mifsud not only told the young Trump adviser about Russia having stolen emails but also introduced him to a mysterious Russian woman, who Papadopoulos said he thought — wrongly, as it turned out — was Putin’s niece, and later to Ivan Timofeev of the Russian International Affairs Council, a think tank then–Russian president Dmitry Medvedev created by decree in 2010. “So he’s identified as a potential asset because of his ambition and proximity to the Trump campaign by the professor, who then brings in a Russian associate likely from the intelligence services herself and eventually George gets handed off to a mysterious individual in Moscow who claims to be working for the Ministry of Foreign Affairs,” said the Central European counterintelligence agent, describing how counterintelligence officials would likely interpret these actions. Papadopoulos, however, did not land a position in the Trump administration and was being questioned by the FBI just seven days after Trump’s inauguration. There was no mention of Russia or NATO’s position on Russia’s involvement in Ukraine, which was a flashpoint when Kammenos visited Washington in 2015. Then–defense secretary Carter and his deputy Robert Work both canceled meetings with Kammenos, citing a scheduling conflict. Greek media tied the snub to Kammenos’s very public support of a military-to-military relationship between his country and Russia. Instead, Kammenos was offered a meeting with then–undersecretary of defense for policy Christine Wormuth. Having hoped for a meeting and a photo op with Carter himself, Greek defense officials seemed insulted but agreed, according to a former Pentagon official who said that the sit-down soon became a testy back-and-forth. During their meeting, Wormuth tried to convince Kammenos to back another round of sanctions on Russia, and he refused, calling Russia "an ally and friend, with whom we are related to with indissoluble bonds," according to the Greek Defense Ministry. "I was asked to support the prolongation of the sanctions, particularly in connection with Crimea. I explained the Ukrainian issue was very sensitive for Greece, as some 300,000 Greeks live in Mariupol and its neighborhood, and they feel safe next to the Orthodox Church," he told Greek journalists afterward, according to a transcript on the Greek Defense Ministry’s website. Before Wormuth’s meeting with Kammenos she would have been provided with a biography from the intelligence community that would have noted his involvement with Russia, according to an official with knowledge of the matter. The desk officer who prepared the materials would have been very aware of Kammenos’s ties to Russia, the official said. Donald Trump posted this photo to his Instagram account. George Papadopoulos is third from the left. Papadopoulos’s importance to the Trump campaign remains disputed. Early in February, Rep. Devin Nunes, the California Republican who chairs the House Intelligence Committee, said in an interview with Fox News that Trump had never met Papadopoulos, an assertion seemingly refuted by a Trump post on his Instagram account showing Papadopoulos seated at a table, with Trump at its head. Also in the photo are then-senator Jeff Sessions, now Trump’s attorney general, and J.D. Gordon, a former Pentagon spokesperson who would be the Trump campaign’s point person on foreign policy platform issues at the Republican National Convention three months later. That same day, Trump described Papadopoulos as an “excellent guy” when he unveiled his foreign policy team to the editorial board of the Washington Post. Greek journalists who interacted with Papadopoulos during his visits to Greece in the months after that photo was posted say he told them that Trump personally phoned to ask him to join the campaign. “He told me that Trump had called him for about five minutes in a casual conversation when he asked him to join the campaign and that on March 21 they’d met at the unfinished [Trump] hotel in Washington, DC,” said Kakaounaki, who covered Papadopoulos’s visits to Greece for Kathimerini, the Athens newspaper. It is unclear who made up the guest list for the pre-inauguration reception at the St. Regis Hotel where Kammenos, Papadopoulos, and Priebus were photographed. Trump adviser Anthony Sacramucci, who at the time was expected to be named to lead the Office of Public Liaison and Intergovernmental Affairs, was also photographed at the reception. He said he’d been invited in an email that he is “pretty sure” went to “all assistants to the president.” He said he doesn’t remember who sent the email. Trump campaign adviser Anthony Scaramucci was photographed at the St. Regis Hotel Jan. 19, 2017. Papadopoulos and Kammenos were photographed at the same reception. The NATO security officer was not surprised that Kammenos and Trump administration officials would be brought together by something as innocent as a church event. Bergengruen reported from Washington. Thomas Frank and Mary Ann Georgantopoulos contributed additional reporting to this story. The Mysterious Professor At The Center Of The Russia-Trump Probe Has Disappeared. Even His Girlfriend Can't Find Him.